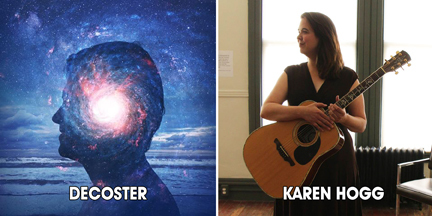 Singer-songwriter DeCoster and eclectic acoustic performer Karen Hogg play Best Video Performance Space on Wednesday, Apr. 17. The show starts at 8 PM and the cover is $10. DECOSTER is the musical project of singer/songwriter Paul DeCoster. Based in Brooklyn, NY, he combines the elements of adult contemporary pop from Bryan Adams to Shawn Mendes with elements of progressive rock like Rush. His writing style, much like the themes of his upcoming album “Universe”, covers worlds beyond and within. He performs frequently in the Northeast with percussionist Rich Kulsar who adds elements of world beat to the mix. Multi-instrumentalist Karen Hogg is a prolific performer, author, and educator. Her influences are wide-ranging with a foundation in American Roots music. One might hear anything from Norman Blake to the Beatles to an Iron Maiden song re-imagined as a cowboy tune during her sets. A sought-after side-person as a mandolinist and a lead guitarist, Karen plays with several groups, including Flint Ladder. 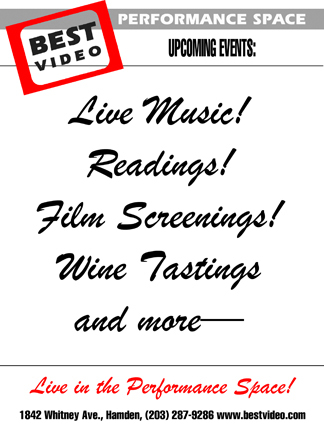 She’ll be taking center stage for this performance at Best Video, playing a rare solo set. Hogg also has a deep interest in the roots of American music, from a historical, cultural, and musical perspective. In 2015, Karen received her master’s degree in Folk Studies/Folklore from Western Kentucky University. She is currently delving into the catalogue of murder ballads, both as repertoire and cultural signifiers. This research will culminate in a concert on the next International Women’s Day, March 8th, 2020, at First Church in Middletown, titled The Murder Ballad Project: Reframing Songs of Violence. Hogg will be joined by other women performers, exploring what these songs mean in a modern-day context.